Try Chef Andrew Underwood’s perfectly seared ahi tuna recipe. 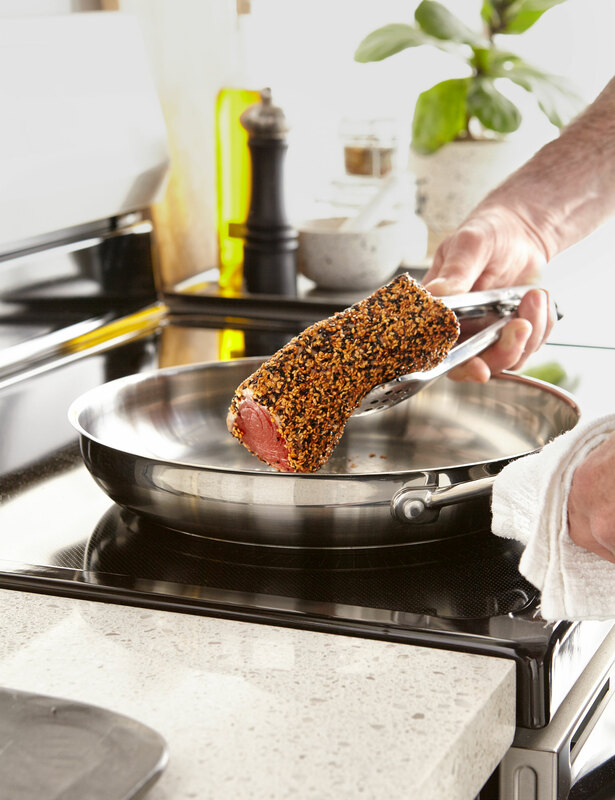 The tasty sesame crust, done to perfection on an induction range (we used Frigidaire’s Gallery Stainless Steel Freestanding Electric Induction Range), playful wasabi mayo and salty-sweet Mirin dipping sauce will delight your guests. 1. Add all Wasabi mayo ingredients in a bowl. Mix well with a fork. 2. If you have a squeeze bottle, pour into the bottle and decorate the plate. Or use a spoon or fork for a similar effect. 1. Add all ingredients in a bowl. Mix well with a fork. 1. Mix the sesame seeds on a plate. Lay the tuna on the seeds and press. 2. Heat a heavy bottom induction-compatible pan over medium-high heat. Add the oil. When it is shimmering, but not yet smoking, carefully add in the sesame crusted tuna. 4. Remove from the heat and slice in 1/4″ slices. Serve with the wasabi mayo, Mirin dipping sauce and some pickled ginger. Enjoy! Want a spicy drink to complement your meal? Try this Jalapeno Watermelon Margarita.